The Sung Dynasty (960–1278) was a time of vast changes and new challenges in China. The growth of the urban and rural economics, population increase, the emergence of an educated elite, political and intellectual ferment, and threats from hostile neighbors are some of the forces that shaped the age. How did Sung statesmen and thinkers view the relation of state and society and the role of political action in solving society’s ills? The essays in Ordering the World explore contemporary ideas underlying policies, programs, and institutions of the period and examine attitudes toward history and sources of authority. 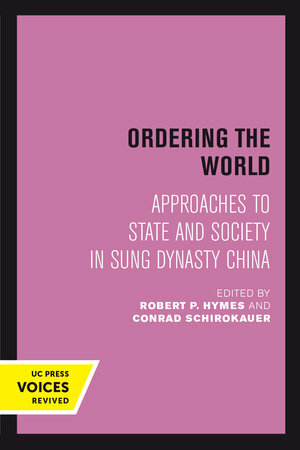 Their findings have important implications for our understanding of the neo-Confucian movement in Sung history and of the Sung in the history of Chinese ideas about politics and social action. Robert P. Hymes is Carpentier Professor of Chinese History in the Department of East Asian Languages and Cultures at Columbia University. Conrad Schirokauer is a Senior Scholar and Adjunct Professor in the Department of East Asian Languages and Cultures at Columbia University.